Stippling is the process of using dots and very small dashes to create a drawing. The use of different sized dots and the way they are spaced gives differing effects. For example, you can add a gray tone just by making marks that are regularly spaced in a cluster. These tiny stipple markings suggest form, shape, depth and contrast. They also convey light and shadow. It's a great idea to use the stipple process with fine line drawings, they go together very nicely. 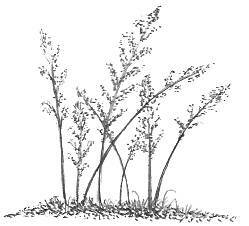 For the illustration of weeds, I dotted my pencil around the stalks and I was very pleased with the resulting picture. The ground was depicted with the use of stippling and some short dashes as well. You can use various types of pencil leads to give different effects. A H lead would show a light gray and B pencils give a nice dark tone. The more pressure you apply, the darker it is. A large stippled drawing would be very time consuming to complete and it requires a lot of patience so make sure you are up to that challenge before you start. If I was going to create a bigger drawing than the ones shown here, I think I'd use a fine felt tip pen which is what experienced stipple artists use. You can create dark tones just by increasing the amount of dots in one area. Alternately, you create lighter tones by spreading them out. This is really another method of shading that you can choose to use. You can even map out your next illustration by using a series of small marks, instead of using faint lines. To create perfect hair for animals, simply combine stippling with lines of all different lengths and thickness. If you use stippling along with hatching and scribbling, you create artwork that contains all the different shading patterns. Include the various hatching styles - cross, random and curved hatch as well. Art gets more exciting when you start experimenting and using a different approach. You can finish up with some very interesting artwork when you mix all different techniques as well as mediums into one piece. Personally, I like using a mixture because it makes me feel like I'm creating something completely original. If you love drawing portraits, try incorporating this technique into your next piece. I drew these lips and stippled in the shadow. Go on an adventure and experiment with how you can use this to your advantage. After all, discovery is half the fun in this hobby! Depending on the subject I want to re-create, I find it is a lot simpler in some cases to "dot-out" the outline. The dots are easy to draw over and I don't have to worry about erasing them later. 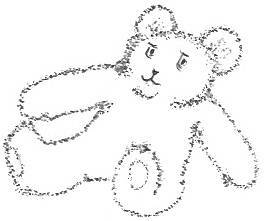 This teddy bear drawing didn't turn out very well but it was worth the effort just for practice purposes. At the time of creation, I was experimenting to see what I could produce with some idle dots here and there, so overall, I was fairly pleased with the outcome. If you decide to use the stippling technique regularly, then you will have added a whole new dimension to your drawings. Congratulations on your bravery to try something different!